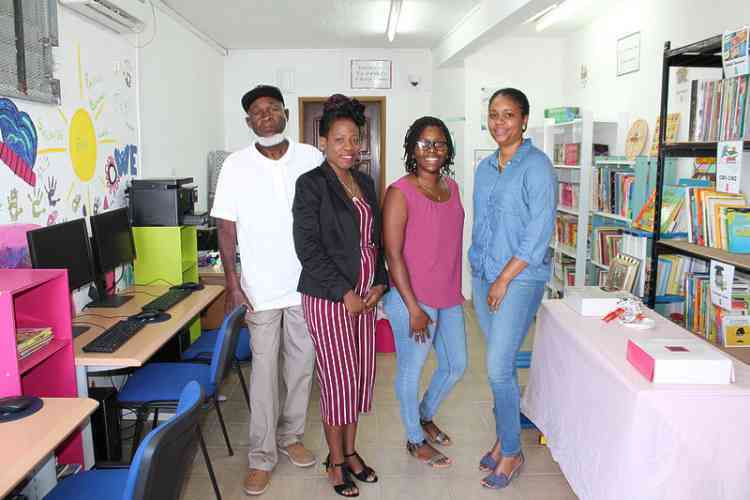 At the library opening were (from left): President of Aim for Success Georges Richardson, Administrator Evelyne Delva, Librarian Gerline Pierre, and Assistant Director Jeanette Boirard. (Photo Robert Luckock). MARIGOT–Association Aim for Success inaugurated its new library at 65 Rue Lady Fish, Sandy Ground on Tuesday morning. Aim for Success works closely with Sandy Ground on the Move Insertion. The library has a variety of books in French, English and Spanish as well as reference books, and more are expected to be donated. There are also four computers for internet access. “Today is an important day for the district and the people as education is so important for our young people,” said association President Georges Richardson. “For years we have been fighting hard for something like this. Even though the space is quite small it is better than not having a library at all. Young people can come here, read or borrow books, or do research for their school lessons. Richardson explained the building housing the library did need repairs to the roof after Hurricane Irma. Aim for Success shouldered the expenses with help from Compagnons Batisseur which provided materials and has been doing reconstruction work in French Quarter and Sandy Ground. The hours of the library are Monday to Friday from 8:30am to 12:30pm and from 2:00pm to 3:30pm. A librarian is always present. The library also offers some administration services, writing letters and help with filling forms, for example for the Employment Office (Pole Emploi). Two months ago the independent power producer, Contour Global, donated school supplies, book and computers to Association Sandy Ground on the Move Insertion as part of the company’s community outreach programmes. The library received some 750 reading books, five computers and shelving for the books. Employees from the different Contour Global offices in Paris and Guadeloupe participated in gathering the materials.